Fighting turns southern Yemen town into "hell"
ADEN/JEDDAH (Reuters) – Bodies lay in the streets of a southern Yemeni town Wednesday as government forces battled Islamist militants, a local official said, underscoring the gravity of Yemen’s multiple conflicts. President Ali Abdullah Saleh, 69, wounded Friday when rockets hit his palace, is having treatment in the Saudi capital Riyadh but there were conflicting reports about his condition — ranging from fairly minor, to life-threatening 40-percent burns. A truce between his forces and tribesmen who back pro-democracy protesters was holding in Sanaa. Western and Arab powers have been working to persuade Saleh to stay away and allow a long-negotiated transition of power to begin. Saleh has left a country in crisis, with Yemeni civilians bearing the brunt of fighting. Medical staff are having trouble reaching the wounded, and electricity and water are scarce, the International Committee of the Red Cross (ICRC) said. Some 20 bodies have been retrieved in and around Sanaa since Saturday by ICRC and Yemen Red Crescent teams, including seven Tuesday in al-Hassaba, north of the capital, the ICRC said. “Because of the fighting, it has often been difficult for medical personnel to reach certain parts of Sanaa,” said Jean-Nicolas Marti, the head of the ICRC delegation in Yemen. The U.N.’s World Food Program (WFP) said Yemenis are going hungry as the fighting disrupts food supplies and pushes up the price of gas, water, fuel and other basic commodities. Sanaa was calm in Saleh’s absence, with a ceasefire holding between government forces and tribesmen loyal to Sheikh Sadeq al-Ahmar, head of the powerful Hashed tribal confederation, who have turned against the president. More than 200 people have been killed and thousands have fled Sanaa in the last two weeks as fighting intensified. Al-Ahmar’s men withdrew from around seven government buildings, including the state news agency Saba which suffered heavily in fighting last week. But many government ministries were not functioning as staff stayed away Wednesday and much of the city was suffering from cuts in electricity, fuel and water supplies. Officials and residents described dire scenes in the southern Abyan province where the army and Islamist militants have fought for days, causing thousands of residents to flee. Health official Alhadar Alsaidi said disease was spreading from dead bodies on the streets and wild dogs eating them. “I call on local and international health organizations to help us removing bodies from the streets and burying them,” he said. The Yemeni army said this week it had killed 30 militants in Zinjibar, where a local official said 15 soldiers had also died in battles for the town seized by gunmen nearly two weeks ago. Some of Saleh’s opponents have accused the president of deliberately letting al Qaeda militants take over Zinjibar to demonstrate the security risks if he were to lose power. The volatile situation in Yemen, which lies on oil shipping lanes, alarms Western nations and neighboring oil giant Saudi Arabia, who fear that chaos would give al Qaeda free rein there. They see Saleh’s absence as an opportunity to secure his exit after nearly 33 years ruling the poorest Arab state. The United States and Britain have called for a peaceful, orderly transition in Yemen, based on a Gulf-brokered plan. There was no clear word on Saleh’s health. “I visited him yesterday evening and he was good. He talked to us and asked about the Yemeni expatriates and he is better than the others who were injured. He is very good and talks. He was sitting on a chair,” said Taha al-Hemyari, head of Yemeni community affairs at the Yemeni embassy in Riyadh. A Saudi doctor familiar with Saleh’s case also said his burns were not as serious as some officials suggested, saying he may be able to leave Saudi Arabia in less than two weeks. The Yemeni embassy in Washington said in a statement Saleh’s health was improving and reiterated that his deputy Abd-Rabbu Mansour Hadi was in charge in a caretaker capacity. “President Ali Abdullah Saleh’s health condition is stable and continues to improve… President Saleh will return to Yemen … to reassume his duties soon after he recovers,” it said. 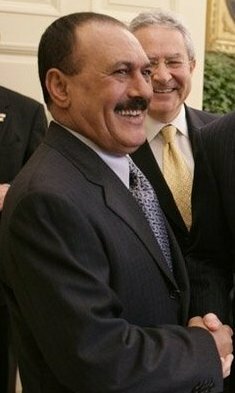 Yemeni and U.S. officials said Tuesday that Saleh was in a more serious condition with burns over roughly 40 percent of his body. Saudi newspaper al-Watan cited a Yemeni diplomat on Wednesday as saying another operation on Saleh was possible. Saleh was initially said to have been hit by shrapnel and Hadi said Monday the president would return within days. Forty percent burns would mean Saleh’s life could be in danger: “Somebody of that age, with that percentage of burns, has got a pretty poor prognosis, especially if these are full thickness burns,” Brendan Eley, chief executive of the Healing Foundation at Britain’s Royal College of Surgeons. Saudi officials say it is up to Saleh whether he returns home but they, and their Western allies, may want to revive a Gulf-brokered transition deal under which the Yemeni leader would quit in return for immunity from prosecution. Yemen said a donation of three million barrels of crude oil from Saudi King Abdullah had arrived in Aden Wednesday. Thousands of protesters, who have been in the streets since February demanding Saleh quit, gathered at his vice president’s residence Tuesday. They want him formally to assume power in order to effect Saleh’s final removal from office. Troops loyal to army general Ali Mohsen, who has sided with the protesters, shot into the air in an effort to persuade them to leave, but the activists stayed put. This entry was posted on June 9, 2011 at 6:01 PM	and is filed under War Quotient. Tagged: al qaeda, Ali Abdullah Saleh, Ali Mohsen, death, decay, destruction, exopolitics, International Committee of the Red Cross, International Red Cross and Red Crescent Movement, portals, Saudi Arabia, stargate, United States, yemen, Zinjibar. You can follow any responses to this entry through the RSS 2.0 feed. Responses are currently closed, but you can trackback from your own site.